Flow is a collection of 65 pads whose character is best described as a continuous flow. There are mellow pads, deep pads, lush pads, rich pads, soft pads, detuned pads, organ pads and more, all sharing one purpose. 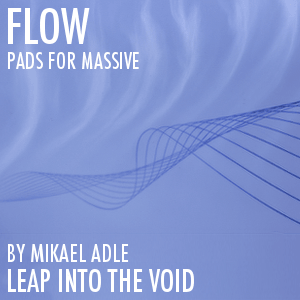 If you want you could call them, basic pads with a touch of Leap Into The Void. Leap Into The Void have named them ”Flow”. All sounds can easily be found in Massive’s browser and they all contain a coherent mapping of the eight macro knobs. Suited for any type of ambient music, electronic, pop, rock. Velocity and mod wheel assignments for character coloring (mod wheel macro knob 1). Note: All pads heard in the demo come from “Flow” with no fx used but a small amount of limiter on the output. Bass and lead sounds come from Leap Into The Void’s Massive soundset Fundamental.